When I think back to my own childhood, it’s hard to recall my parents or teachers reading aloud to me. I have an old black-and-white photo which shows my mother reading to me as we lay in bed together—when I was very small—but by the time I entered elementary school and began reading on my own, I suspect whatever reading aloud was done at home soon ended. And the same, it seems, was true of school: I wrack my brain, but I’m unable to pinpoint a single teacher who read to my class regularly throughout those years. If only The Read-Aloud Handbook had been around back then. 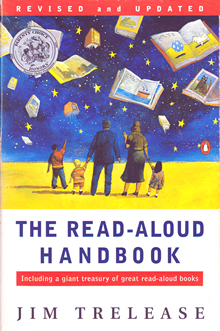 The first edition of The Read-Aloud Handbook was published in 1979 (when I was a long-haired high school student), and ever since, its author Jim Trelease has been an influential champion of reading aloud to children. The Read-Aloud Handbook is highly recommended for its persuasive look at the benefits of reading aloud, both at home and in schools, along with the long, descriptive list of good read-aloud titles in the latter part of the book. Jim Trelease also maintains an excellent website (www.trelease-on-reading.com) that I would encourage you to visit. In fact, the website includes much of the information found in his book as well as a similar list of read-aloud suggestions. The Read-Aloud Handbook also includes perhaps my favorite story about the power of reading—an account which seems to me is proof positive of the case for reading long made by the linguist and researcher Stephen Krashen (which I outline in The Power of Reading). The most dramatic example of learning by simply reading is found in Robert Allen. Fatherless at birth in 1949 and abandoned by his mother at age six, Allen was raised by his grandfather, three great-aunts, and a great-uncle living in a farmhouse without plumbing in the hills of west Tennessee. And there Robert Allen stayed for the next twenty-six years, never attending school or riding a bicycle or going to a movie theater or having a single playmate his own age. When he was seven, one of his aunts began reading to him and soon taught him to read for himself. His grandfather then taught him to write. He began reading the Bible to his blind aunt. Since his relatives were so elderly, one of them was always bedridden, and young Robert’s duty was to take care of them. Looking to fill the vacant hours, at age twelve he picked up an old copy of Shakespeare’s plays. Soon he was scavenging yard sales for old books, magazines, and comics. Books became his playmates, his escape from the loving but grim reality of where he was. He read anything and everything until he discovered the county library. There the world’s classics awaited him and he waded into them, even teaching himself to read Greek and French, until he had read every book in the library. Not surprisingly, the librarian encouraged him to pursue a college education, and in 1981, at age thirty-two, he showed up at Bethel College, a small college just fifteen miles from his farmhouse. His placement test showed he knew more than almost every faculty member, and they had him skip the freshman year. Graduating in three years, he went on to Vanderbilt University, where he earned simultaneous master’s and doctoral degrees in English. For a guy who came from the Tennessee backwoods, where they weren’t exactly speaking the King’s English, who missed all those childhood spelling quizzes, vocabulary tests, book reports, and the fifteen questions at the end of every chapter, who did no seat work except free reading for twenty-five straight years, and, by my calculations, missed at least 8,000 worksheets, he certainly did all right for himself. How about you? What do you think of Jim Trelease’s book or his website? Thanks for the book review and the link to the great site. Anything with a story from Stephen Krashen in it is well worth a look. His work greatly influenced my thoughts on teaching English as a foreign language. Stephen, thanks for stopping by. I hope all is well with you and your family these days. Yes, Krashen’s work has had a significant impact on my own teaching and parenting, too. Adam, thanks for sharing your favorite story of Jim Trelease about Robert Allen & the power of reading! I’m glad that story spoke to you!